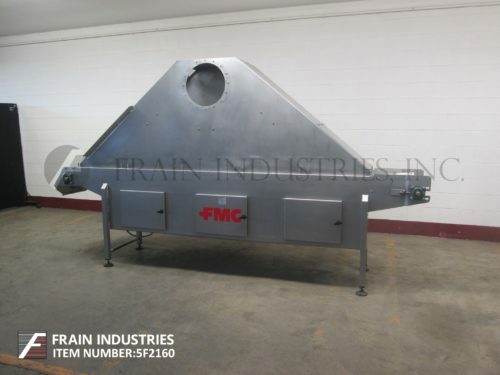 Home » Equipment » Schebler Cooler Tunnel 24" X 1034"
Schebler, 24" Wide belt x 86′ Long, air cooling tunnel. Equipped with (11) 94" long modular sections with 7½" product clearance, top air cooling, flip down access doors and a 34" in feed / discharge height. Cooling system consists of (4) cold air blowing sections each with a 7½ hp blower with cooling coil, (2) 1" NPT connections for refrigerant, thermometer and temperature control dials. 10 ton water chiller.